Warm, wet conditions rapidly kicked off the melt season this weekend, more than a month-and-a-half ahead of schedule. It has easily set a record for earliest melt season onset, and marks the first time it’s begun in April. Maps show the current melt area centered around southwest Greenland. The graph shows the current melt season in blue and the average in black. Little to no melt through winter is the norm as sub-zero temperatures keep Greenland’s massive ice sheet, well, on ice. Warm weather usually kicks off the melt season in late May or early June, but this year is a bit different. Record warm temperatures coupled with heavy rain mostly sparked 12 percent of the ice sheet to go into meltdown mode (hat tip to Climate Home’s Megan Darby). Almost all the melt is currently centered around southwest Greenland. According to Polar Portal, which monitors all things ice-related in the Arctic, melt season kicks off when 10 percent of the ice sheet experiences surface melt. The previous record for earliest start was May 5, 2010.This April kickoff is so bizarrely early, scientists who study the ice sheet checked their analysis to make sure something wasn’t amiss before making the announcement. “We had to check that our models were still working properly” Peter Langen, a climate scientist at the Denmark Meteorological Institute (DMI), told the Polar Portal. But alas, the models are definitely working and weather data and stories coming out of West Greenland have borne that out. According to DMI, temperatures at Kangerlussuaq, a small village in southwest Greenland, set an April record for that location when they reached 64.4°F (17.8°C) on Monday. 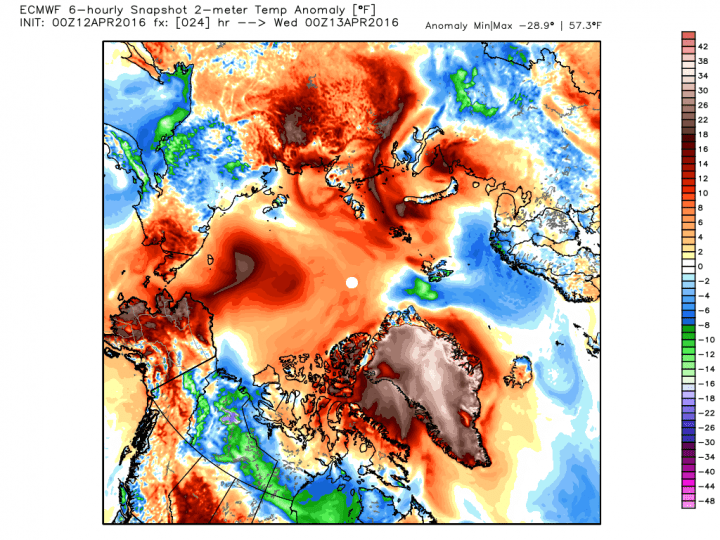 That’s just a scant .4°F (.2°C) off the all-time Greenland high for April. Heavy rain have also inundated local communities. The summit of the Greenland ice sheet has also been record warm. On Tuesday, it reached 20.3°F (-6.5°C) which while obviously below freezing, is still record mild for this time of year and is roughly 40°F above normal. And the wamrth isn’t over yet. Temperatures could reach as high as 57°F above normal this week. It’s distinctly possible more temperatures records could fall before the week is out. Temperatures anomalies for Wednesday afternoon forecast by the Euro model. In Greenland, the temperature could reach as high as 57°F above normal. And while normal temperatures are expected to return, the impacts of this warm stretch will remain with the ice sheet. Energy of all that melting ice is expected to wend its way a bit deeper into the ice pack, making it easier for continued melt later in the season. The Greenland ice sheet represents one of the most massive stores of ice on the planet. If it were all to melt, it would raise oceans about 20 feet. Melting ice is also affecting ocean circulation and even the drift of the North Pole. Climate change has been cutting into Greenland’s icy reserves, with warm air and water temperatures leading to the loss of millions of tons of ice each year. Dust and soot from forest fires in Canada and Siberia have also expedited the ice sheet’s melt. But how this melt season progresses depends a lot on the weather. Last year, a cool spring kept Greenland mostly solid before a summer heat wave led to a rapid meltdown of the ice sheet. And in July 2012, a record-setting 95 percent of the ice sheet experienced surface melting due to high temperatures and soot from wildfires in Siberia. It remains to be seen how the weather plays out in the coming months. But regardless of this year’s weather, it’s increasingly clear the planet’s ice is in for a rough ride. By 2100 the entire Greenland ice sheet could experience melting every year if temperatures continue to rise. ← Zika: Another warning flag of health threats due to climate change?